In this guide, we will see the Implementation of LinkedList class with examples. Java LinkedList class uses a doubly linked list to store the elements. It provides a linked-list data structure. It inherits the AbstractList class and implements List and Deque interfaces. Java LinkedList class can contain duplicate elements. Java LinkedList class maintains insertion order. In Java LinkedList class, manipulation is fast because no shifting needs to have occurred. 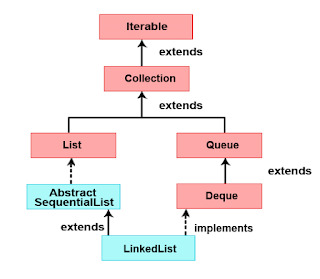 The LinkedList class implements Queue and Deque interfaces. Therefore, It can also be used as a Queue, Deque or Stack. Java LinkedList is not thread-safe. You must explicitly synchronize concurrent modifications to the LinkedList in a multi-threaded environment. Let's discuss adding elements to LinkedList using different methods. Adding new elements to the end of the LinkedList using add() method. Let's first create LinkedList with few fruits and then use remove methods to remove fruits from LinkedList. Remove the first element in the LinkedList. Throws NoSuchElementException if the LinkedList is empty. Let's create a list of employees and apply LinkedList search methods. 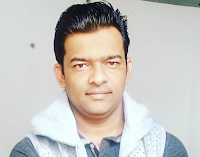 Let's create an example to list a number of customers and maintain the insertion order. ArrayList internally uses a dynamic array to store the elements. LinkedList internally uses the doubly linked list to store the elements. Manipulation with ArrayList is slow because it internally uses an array. If any element is removed from the array, all the bits are shifted in memory. Manipulation with LinkedList is faster than ArrayList because it uses a doubly linked list so no bit shifting is required in memory. ArrayList class can act as a list only because it implements List only. 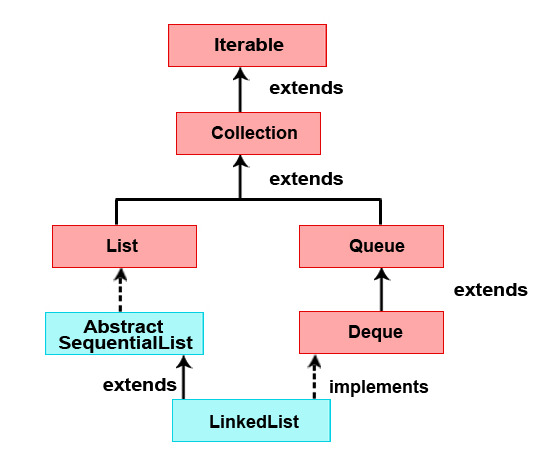 LinkedList class can act as a list and queue both because it implements List and Deque interfaces. ArrayList is better for storing and accessing data. LinkedList is better for manipulating data.